NATIONAL HARBOR, Md. — What’s in a word? Everything, for the young “spellebrities” who generally looked nervous as they stood before the judges at the Scripps National Spelling Bee on Wednesday awaiting the word they had to ace to remain in the competition. Not David Lye, though. The 10-year-old 5th grader at Sunnyside Elementary School in Olathe barely reached the tip of the mic as he stood in the spotlight. As soon as Jacques Bailly, the pronouncer, had spoken the word “trecento” (pertaining to the 14th century), Lye fired back the spelling confidently. The next round, he spelled “technophile” (a technology enthusiast) correctly, putting him in contention for one of the 40 finalist slots. 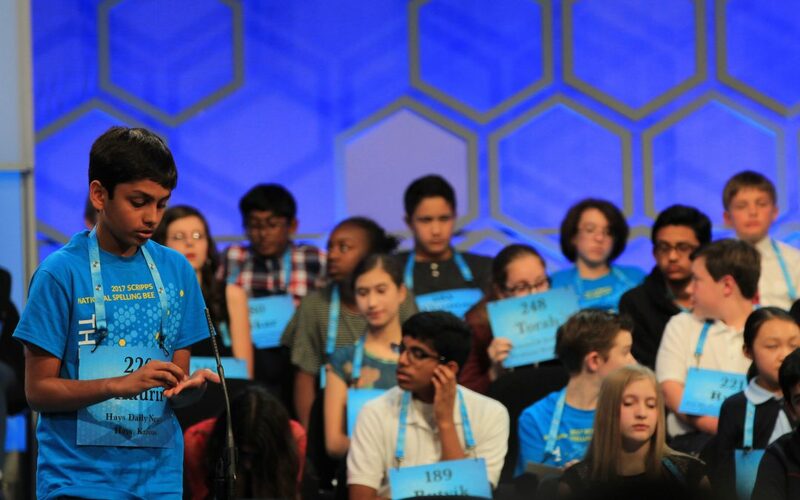 Lye and two other Kansas spellers were among 291 students competing in the knockout stages of the 90th Scripps National Spelling Bee on Wednesday. This year, the competition reached 11 million students across the U.S. as well as six other countries: the Bahamas, Canada, Ghana, Jamaica, Japan and South Korea. At the end of the third round, 188 students remained in the competition. Based on the scores from written test the students had taken on Tuesday, the judges announced the names of the 40 finalists who would be coming back on Thursday. None of the participants from Kansas made the cut. Lyle said he was able to spell his words correctly because “those were words I studied.” He had developed an interest in spelling competitions in third grade when he won a class prize and has not looked back since. This was his first time at the national level and he was loving every minute even though he wasn’t too confident about his chances. Lye’s mother, Kelly Vuong, 44, recalled the time David had come home and announced that he had won the class spelling bee. “We didn’t even know there was a class spelling bee,” she laughed. For the past one year, Lye and his mother used different computer applications to find new words and learn their spellings. They would study up to 40 words every day. It was this daily regimen that had brought him to the national stage, she said. Come back he did, and this time he made it to the national level where he found his new favorite word: “niveau” (a level of existence or achievement), which he spelled correctly in the second round. “He [Peter] has always been competitive and we [parents] try to support him as much as we can,” said Peter’s mother, Amy Westbrook, who was accompanying him on his maiden trip to Gaylord National Resort in suburban Washington where the bee is held. Competition was indeed fierce, as the brightest of minds from across the country vied for the $40,000 first prize as well as the bragging rights of the national champion. But this would be her first and only time participating in the competition (she has just finished eighth grade) and she wanted to make the most of it. She misspelled “enfranchise” in the third round.